T'wast good, and even bordered on great. Ed Norton did a nice job of Bruce, and Liv Tyler even did a swell job of Betty. Certainly made more sense than the first attempt in terms of comic to movie transformation (better than that movie they called X-Men... bbblllaaaahhhh). Not as good as Iron Man, but definitely cool. A couple of parts made me wonder what the writers where thinking, but you usually get that with such crazy story lines. Stan Lee makes his usual cameo as he does in every Marvel film he has adopted form his original comic's. I definitely recommend it, and considering a Tony Stark makes and appearance theirs a good chance Eds going to be playing the part again. 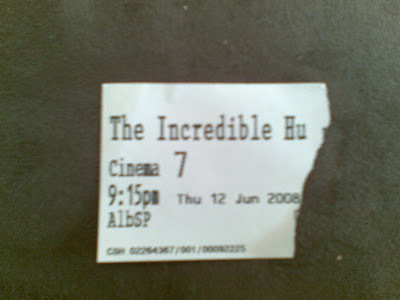 J went in thinking it would be crap, but she came out think it was good, worth seeing in the cinema.